At Legacy Trust, we concentrate on three things — you, your family and the generations that follow. Each family is unique and your wealth management strategy should be the same. That’s why we remain an entirely independent trust-only bank. This independence means we can craft a solution focused around your unique circumstances. Services are provided by a local team of professionals dedicated to your success. Our team members average 20 years of wealth management experience and hold industry-leading accreditations and certifications. It’s our mission to create lasting legacies by providing trusted advice and support that reduces the burden and worry of financial decisions. We recognize that there are no one-size-fits-all solutions when it comes to wealth planning, and we personalize our offerings and recommendations to meet each client’s needs. Unlike our competitors, we won’t recommend any products or services that aren’t in your best interest. Our experienced advisors are empowered to provide fast and convenient decisions and our highly respected Board of Directors provide oversight and governance locally. Legacy Trust and its team members are held to The Fiduciary Standard – an essential foundation of trust, integrity and transparency. As a bank, we are held to strict Capital Adequacy standards that we exceed in addition to holding comprehensive coverage for errors and omissions and fidelity bonding. As fiduciaries, our relationships are held by the highest level of trust, ethical and legal standards. Your family will be guided through life’s transitions and will never be forced to turn elsewhere in the event of your death or incapacity. We design, implement and manage sophisticated investment portfolios for our clients with an emphasis on fundamental research and active management. We respectfully work with other professional advisors, including personal or business attorneys, accountants and insurance representatives, to provide the best possible solutions for our clients. William Walker and Robert Prevette founded Legacy Trust with a vision of delivering unparalleled wealth planning counsel with truly personal client service. For Bill and Bob, meaningful client connections were both a benefit of the job and a bridge to understanding and fulfilling the needs of everyone who walked through the doors. Whether it was alleviating the burden of managing wealth, securing a family legacy for future generations or navigating a challenging trust, Bill and Bob provided sound advice while creating relationships with clients that were enhanced by the local nature of their firm. They also believed in remaining steadfastly independent in their recommendations. To that end, they chose to create Legacy Trust as a chartered trust bank, which holds us to the highest standard of fiduciary responsibility, compliance and governance by a local board of directors. To this day, the entire management team and Board of Directors reside in West Michigan, ensuring decisions are made locally and never handed down by remote corporate officers. Today, the principles Bill and Bob established provide a solid foundation for Legacy Trust. Each and every relationship is important to us because helping you establish your legacy is part of our own. Dedicated to Our Team. Dedicated to You. Empowering our team members to offer the highest quality, independent financial advice is the key to building great legacies — yours and ours. 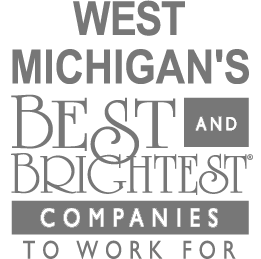 We’re proud to be recognized as one of West Michigan’s Best and Brightest Companies to Work For®.